Some digital pianos come with included stands, pedal units and bench, some don’t. If you decided on a certain digital piano as being the best option for your needs, but it comes without a stand, here you can find a selection of the best keyboard stands available. We compiled a chart below with the best options and further we’ll go into details about those that we thought to offer the most value for money. There are certain aspects that you should take into account when looking for a stand to match your needs. You have to know your digital piano’s dimensions and choose a stand accordingly. The best thing is to go for an adjustable stand, so it’s surely going to fit. We considered this to be a deciding factor. It also should be able to hold your digital piano, this is why we recommend you choose a solid stand that’s able to hold a bigger weight. Let’s go into details on some of the stands that made it to our chart, that we considered to offer the most value. 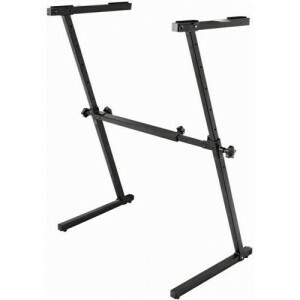 This stand is one of the most versatile products in this category. It can be adjusted to any dimensions and thanks to the “Z” design, lets you play the piano from either side. The center box is a powerful reinforcement for the structure and permits width adjustment as well. The design is solid and efficient. An advantage of this design compared to the “X” design is that it’s easily height adjustable without affecting the width. There’s also enough leg room to play comfortably. 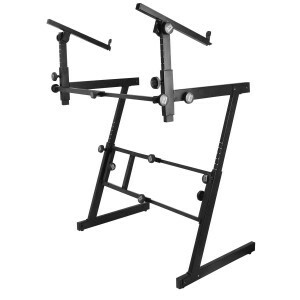 Considering the great value it offers, we thought this is best keyboard stand for any digital piano available right now, of course, we’re talking about those that come without an individually tailored stand. 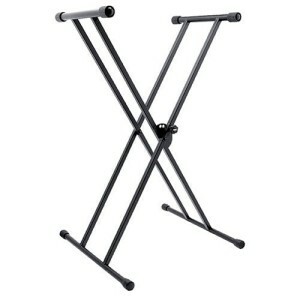 We thought this “X” style keyboard stand to be among the best in its category. It ranges in height between 26.0″ – 38.5″, in length between 30.0″ – 11.0″, in width between 11.0″ – 16.75″ and has a weight capacity of up to 300 lbs. It also fits multiple models of digital pianos. It has some drawbacks when compared to the “Z” design, but other than that it’s a good choice as well. It has a solid double barred structure. Most people who have bought this product thought it was a great fit for them and hardly found anything to object about. This is the perfect choice for anyone looking for a professional accessory for his digital piano. 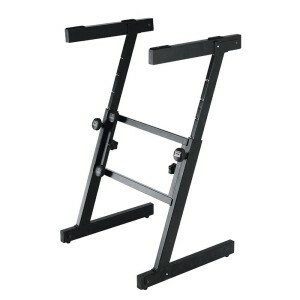 It features a removable second tier that is completely adjustable. 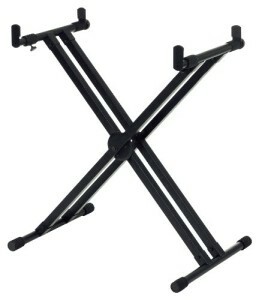 The stand is Z shaped and is fully adjustable as well. You probably would opt for the “Z” design that we went into details above, but if you need something more sophisticated, this will surely meet your needs. It’s also easy to store and to pack for travel, meaning it’s a perfect match if you perform on stage and need to carry your equipment around often.